There are lots of audiophiles in the RF Cafe audience who might appreciate this article on the characteristics of human hearing and ways in which stereo hi-fi equipment attempts to reproduce realistic sound, as if from a live performance. 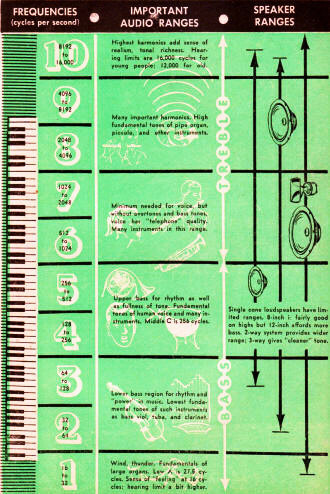 A handy-dandy chart is provided that shows the characteristics of various audible frequency ranges, and the kinds of speakers best suited for reproducing the sound. It was published in 1955, but still should be applicable today. The audio frequency spectrum and its importance in hi-fi. 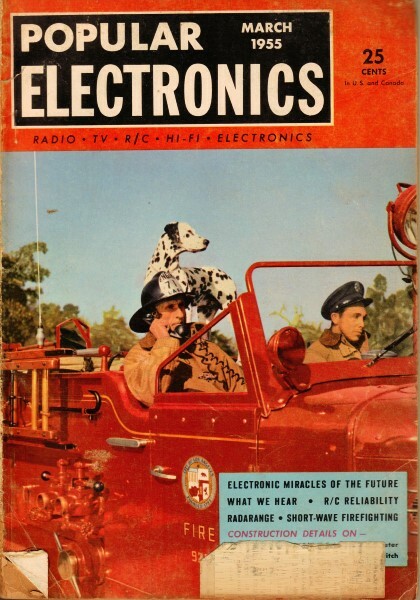 A good approach to high fidelity is to determine what it is that hi-fi enables us to hear. This analysis serves not only to explain the nature of sound, but may well act as a yardstick for evaluating a hi-fi system. All areas within the audio spectrum are important for satisfactory reproduction of sound, particularly music. Even those very high regions above 10,000 cycles contribute to listening pleasure, as this discussion and the chart opposite show. Most of us begin responding to frequencies as low as 16 cps. This is more of a "feeling" point than an actual hearing level. Music does not go down that far. The lowest note on the piano keyboard is 27.5 cycles. The lowest fundamental tones of large organs may go down to 20 cycles, and the little known octa-contra bass clarinet is reputed to hit that low. You can get an idea of the kind of deep, overwhelming power suggested by these "sub-basement" lows if you recall the lowest rumble of thunder you've ever heard. Most music, however, occurs above 32 cycles. The second and third octaves (32 to 128 cycles) are the regions of most bass notes, the all-important rhythm section. The fourth and fifth octaves (128 to 512 cycles) include the relatively higher bass tones such as those produced by tympani and the higher strings of the bass viol. The fundamental tones of most horns, as well as of the male voice, appear in this area. The sixth and seventh octave region, while above "middle C" on the piano, and musically in the treble range, is often termed "mid-range" from the point of view of its coverage by reproducing equipment. This is the frequency area easiest to reproduce. 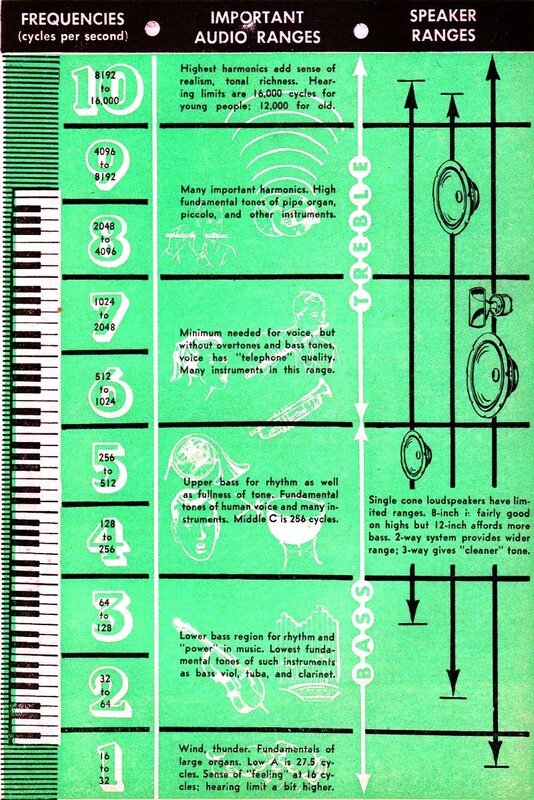 It includes the minimum range needed for voice communication, but without the bass notes below and the overtones above it, a "pinched" quality - like that of a voice on telephone - results. The trumpet's tones extend into this range, as well as those of the female voice. At the upper reaches of this range are the notes of the flute. The fundamental tones of most musical instruments are to be found between the fourth and seventh octaves. The brilliance of clashing cymbals and the piping of the piccolo bring us into the region above 2000 cycles. Violin notes can be heard in this area to well over 3000 cps. The highest piano note, or top of the 8th octave, reaches 4186 cps. Certain speech and musical sounds, of a labial and fricative nature, reach into the 9th octave. Many important overtones, or harmonics generated by fundamental tones originating in lower octaves, are sounded in the 9th. Our ability to hear these overtones helps us, to a large degree, to distinguish between different instruments. It also creates the illusion of "presence" or reality in music reproduction. These harmonics, or overtones, continue up to 16,000 cycles and beyond. To hear them is to perceive the final touch in tonal brilliance and the subtle shadings of instrumental timbre that characterize live performances of music and the best hi-fi reproducing systems. To some extent, this region of frequencies is an audio "no man's land" because of the controversy regarding its importance in reproducing systems. Some observers claim that we can fully enjoy music without the need to catch anything above 12,000 cycles. Others point to the limitations of present-day program sources, such as records and pickups which do not go up to 16,000 cycles. By far, the biggest single problem in assembling a hi-fi system, as regards reproducing the full audio spectrum, is the choice of a suitable loudspeaker and enclosure. Unfortunately, no single speaker has yet been designed that covers the complete audio spectrum. As shown on our chart, the "fi" can become truly "hi" only witha speaker system which uses separate speaker units and correct frequency dividing facilities. When you consider the number and variety of sizes and shapes of instruments that produced the original sounds, you can begin to appreciate why a greater variety of speakers will reproduce them better than a single speaker. And, in any case, no decent bass reproduction is possible without a suitable enclosure for the low frequency speaker.